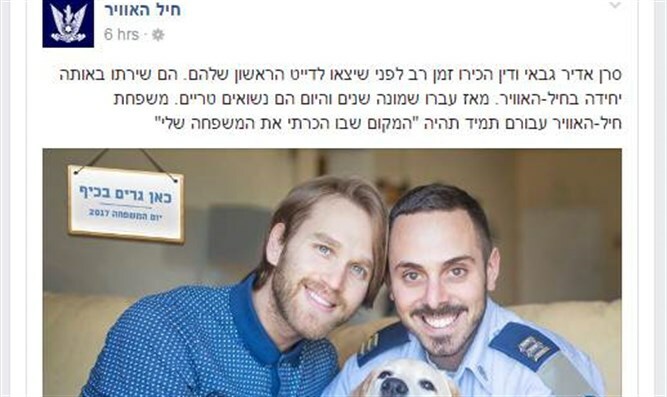 IAF's Facebook page features gay couple and single-parent mom. Leftists using military to re-educate public. From the early 1950s until the 1980s, the 30th of the Hebrew month of Shvat was celebrated as Mothers' Day in Israel, but under "politically correct" influence, it was renamed Family Day in the early 90s. Rather than being a celebration of the good old mom and dad family like Mothers' Day, Family Day is used as a vehicle for talking about alternative households, like gay "marriages" and single mothers. Now, the Israel Air Force, too, has been recruited to the task of reeducating the Israel public to the wonders of the non-traditional lifestyles. The IAF Facebook page featured short portraits of four IAF households, in honor of Family Day, which was marked on Sunday. Two of these portraits were of traditional mom and dad families: one featured a seemingly secular couple with one young daughter, and another showed a haredi couple with five children. The third was a homosexual couple, and the fourth – a single mother with an eight-year-old daughter. Next to the smiling portrait of Captain Adir Gabbai and his partner Dean, the post informs us that the two served in the same unit in the IAF, and that eight years later, they are now "newlyweds". Whoever manages the IAF's Facebook page appears to be oblivious to the fact that Israel has never recognized gay marriage. The single mom is none other than Major Shiri Gal, who is also the IAF's Psychology Officer. The post tells us that she is raising her daughter, Danielle, on her own. It does not tell us why and how this unfortunate circumstance came about. One wonders if the IAF's Psychology Officer is aware of the overwhelming research showing how much better off in life children with two active parents are, as compared to those who grow up in a fatherless environment? The IDF's official website, too, has been intensively promoting gay and transsexual soldiers in recent years, alongside the never-ending campaign promoting combat service by women, which involves lowering the standards for acceptance into combat units. Arutz Sheva has learned that the military's adoption of the anti-family, gender-blurring ideology is backed up by a document propagated by the Chief-of-Staff's Advisor on Matters of Gender (known by the acronym "Yohalam") in late 2015. The documents presents as scientific facts the unproven beliefs held by Gender Studies programs worldwide, according to which there is no innate difference between men and women, and that gender is a social construct. "The perception of humanity as being split up into two groups (men and women) is inaccurate; it casts people into ill-fitting molds, and is a false and inefficient basis for managing the human resource to its full potential", states the official IDF document. In case it requires restating – we note that the above beliefs are completely unsupported by scientific observation and research, as well as by common sense. And yet, it appears the IDF has accepted them as indisputable fact. It continues: "The patterns of male and female behavior and thought do not stem from the physiological and biological differences between them, but are a product of the social ascriptions that we harbor regarding them, as a society... These are merely social constructs that can be changed through social activity". We asked the IDF Spokesman if Yohalam's contention, according to which differences between the sexes are no more than social constructs, has undergone any kind of scientific scrutiny. When we receive a reply, we will publish it.